Independence Day in the U.S. is always celebrated on July 4th. Many businesses are closed that day in observance of this holiday. 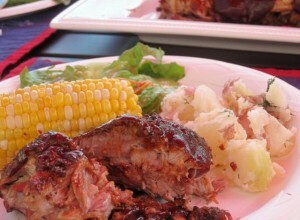 Families and friends get together for a cook out, outdoor fun. In the evening everyone is looking forward to an exciting display of fire works, usually prepared by a local fire department. My contribution to this celebration will consist of links to some of my previously posted recipes, which you may wish to prepare for your guests. These Pork Ribs with Bourbon Whiskey Barbecue Sauce take little more time to complete, but are awesomely delicious, and the meat, literally, falls of the bone. 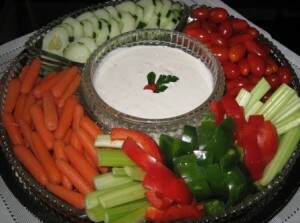 For the vegetarian guests, this easy to assemble Vegetable Platter will be a hit, for sure. 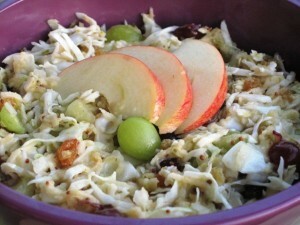 Sweet and Sour Coleslaw is another vegetarian choice, as well as an excellent side dish to accompany your barbecue meats. 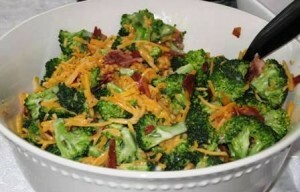 Delicious and healthful Broccoli Salad. 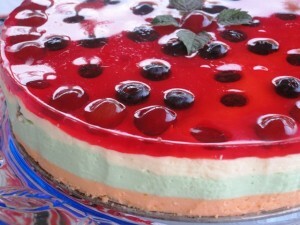 Your gusts will just LOVE this easy, no bake Low Fat Jello Cheesecake. This dessert should be made a day ahead, or several hours before serving, to give it a chance to firm up. 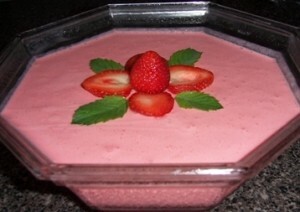 If you are looking for much simpler dessert recipe, nothing will take less effort than this Strawberry Cream Cheese Jello Mold. Enjoy your Independence Day party, and stay safe! It’s great hearing again from you. How is your summer going?